One of the best ways to pass the time while in the van is to listen to audio stories. They can take an hour trip and make it seem like it went in the blink of an eye. And when you’ve got two preschoolers and a toddler, making that long trip seem short is imperative! We recently had the pleasure of listening to The Nutcracker from Maestro Classics. The hour long story is full of engaging narration (Jim Weiss) and breathtaking music performed by the London Philharmonic Orchestra. The Nutcracker ballet is a Christmas tradition around the world. The story of toys coming to life, epic battles between soldiers and mice, sugar plum lands and handsome princes is one that most people are familiar with. Maestro classics has done a wonderful job of making this classic tale child-friendly. Stephen Simon (conductor)includes music from every section of Tchaikovsky’s original great ballet. We all had enjoyed listening to the beautifully done CD and enjoyed looking through the included booklet study guide. As you can see, the study guide enhances the experience of listening to the CD. Learning some history along the way always helps deepen our memory of what we do. Plus, it’s just plain fun! 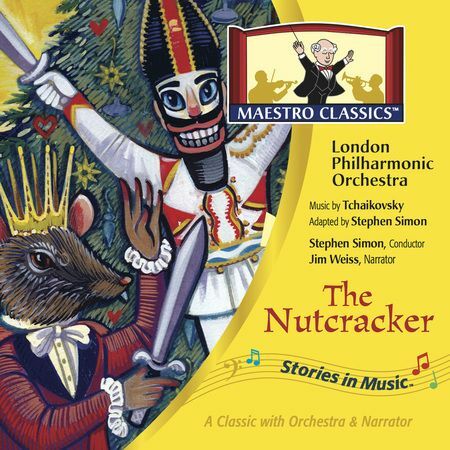 The Nutcracker is one of the CDs in the Stories in Music Series. The award-winning series of great music with narrated stories is musical experience designed to expand listening horizons, develop listening skills, accumulate musical memories, and encourage adults and children to listen to music together. We believe they have achieved their goal. . . with our family at least. Had it not been for Maestro Classics, we wouldn’t be listening to the wonderful music of The Nutcracker. It has brought our family together to listen to and enjoy classical music as a whole. And in a world where classic things seem to be vanishing before our eyes only to be replaced with “new and improved” versions. . . it is one of the things my family will continue to treasure and cultivate for years to come.